Apologies for the late daily post. A great 4G phone signal from 3 Mobile but woeful internet. No, I don’t understand either! Jan wondered why so many people were climbing on and off the large boat moored in front of us on the other side of the junction. 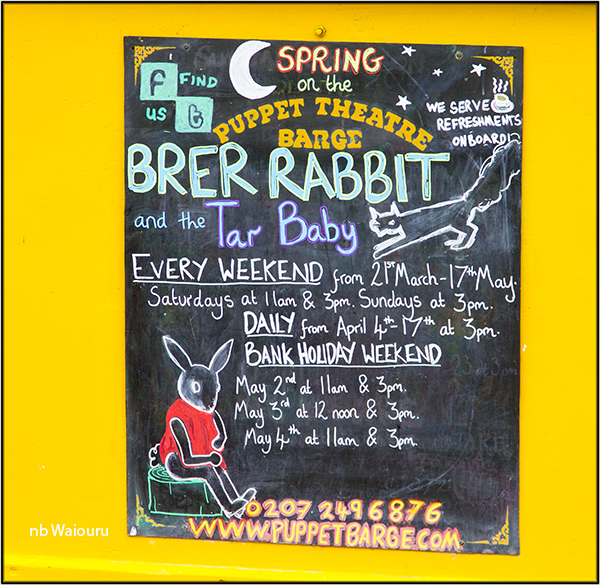 Having already walked around there I was able to tell her it’s the “Puppet Theatre” boat. 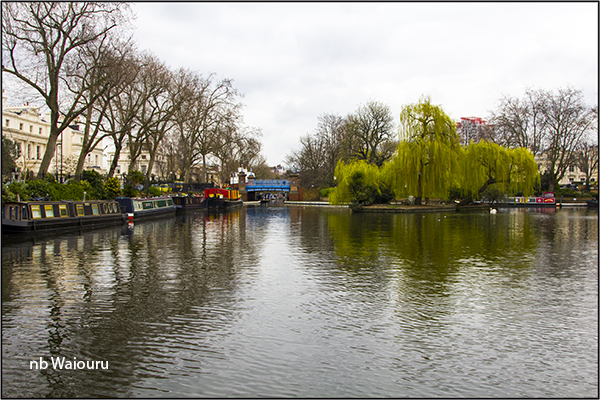 The following is a view towards the entrance to Regents Canal and Maida Vale from Little Venice. The small island in the middle of the junction is Byron Island. To the right and down the Paddington Arm is St Mary’s Hospital. 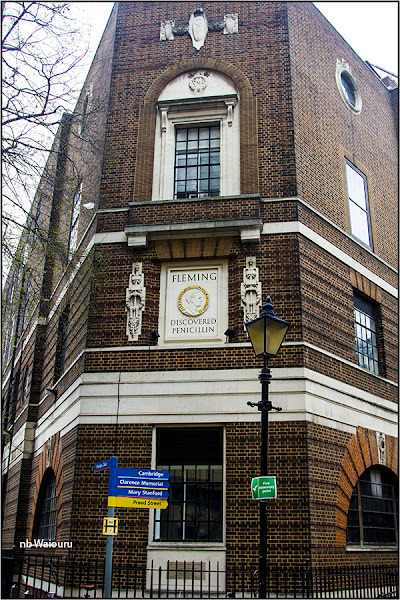 This is where Sir Alex Fleming discovered penicillin in 1928. I happened to notice a relief of him on the wall of one of the older buildings in the hospital complex. The Fleming Museum can also be found here. I wanted another good look around Hyde Park and this time took a more indirect route for a change of scenery. 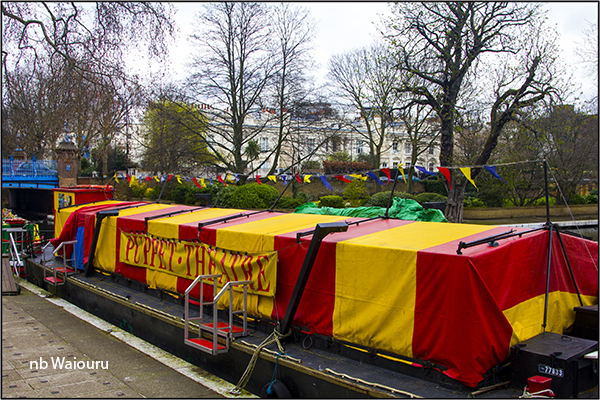 The area around Paddington Station is full of hostels, B&B’s and small private hotels. 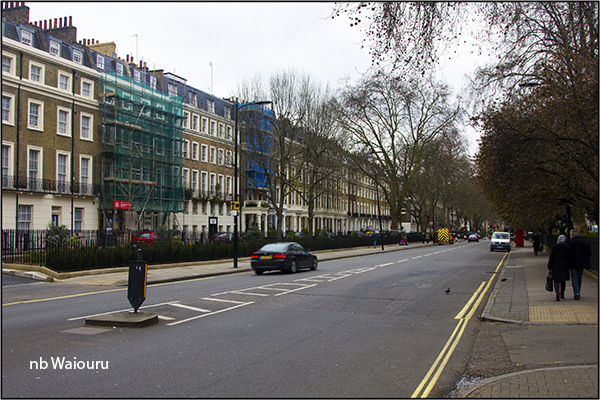 Sussex Gardens road is almost completely lined with them. No doubt these were once London homes of the rich and famous. It was here in 1991 that I met Jan and the boys. They had flown from NZ to join me when I left Iran. Our B&B in Sussex Gardens consisted of one room with a small partitioned cubical containing a tiny shower and toilet. Jan remembers you had to put your feet into the shower to use the toilet! I can’t remember how we managed to book the B&B. It must have been from a magazine because there wasn’t an internet. Breakfast was served in the basement and the B&B was owned by Italians. I walked around the perimeter of Hyde Park in an anticlockwise direction making a small diversion in the bottom right to visit the Australian and New Zealand War Memorials. 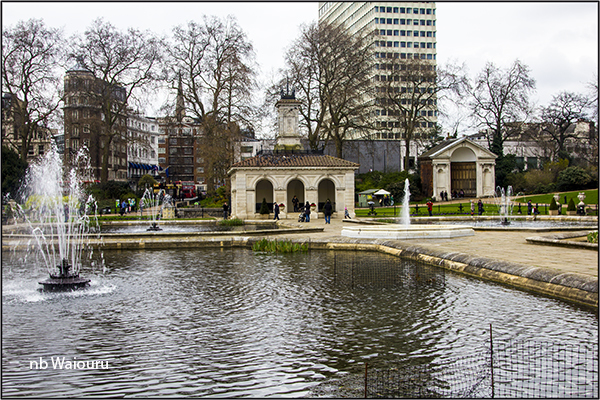 The first major attraction was the Italian Gardens which apparently were a gift from Prince Albert to his wife Queen Victoria. They are located at the top of the Serpentine Lake. 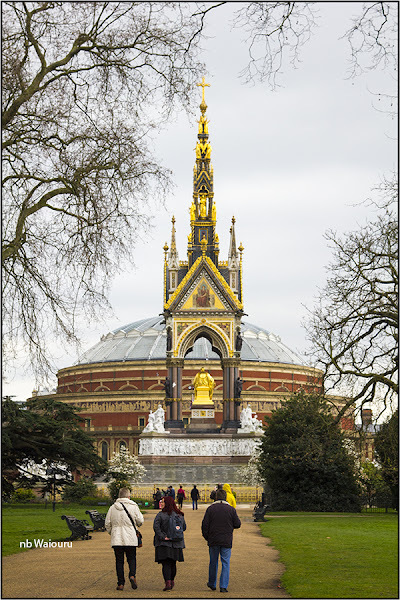 Poor Albert had an early demise and a distraught Victoria erected a memorial to him. In the last post I mentioned Rotten Row. 150 years ago this was THE place on London to be seen whilst out riding. Today the motor vehicle is the mode of transport and consequentially there a few horses. 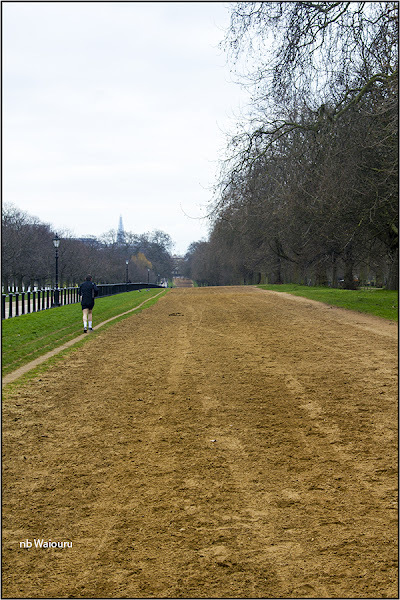 Apparently there are a couple of stables nearby where horses can be rented and the army Horse Guards also use it for exercise. 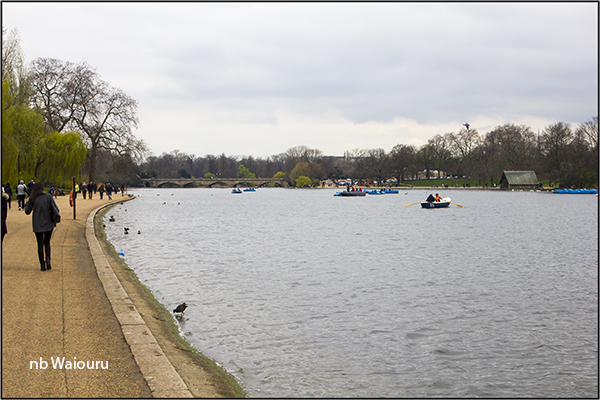 I wandered down to The Serpentine to take a photo of the idiots braving the cold weather by boating. 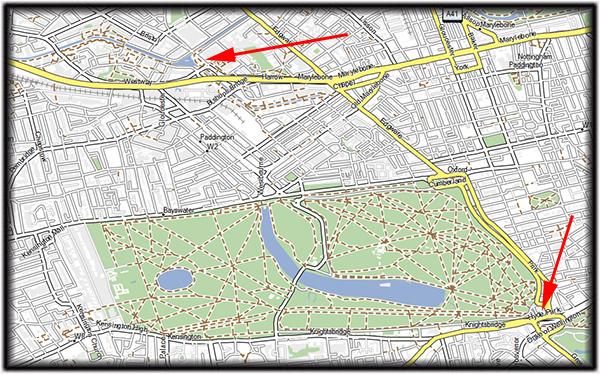 In the south east corner of Hyde Park is Wellington Arch and a statue of The Duke of Wellington. There are also a number of war memorials. Wellington Arch. 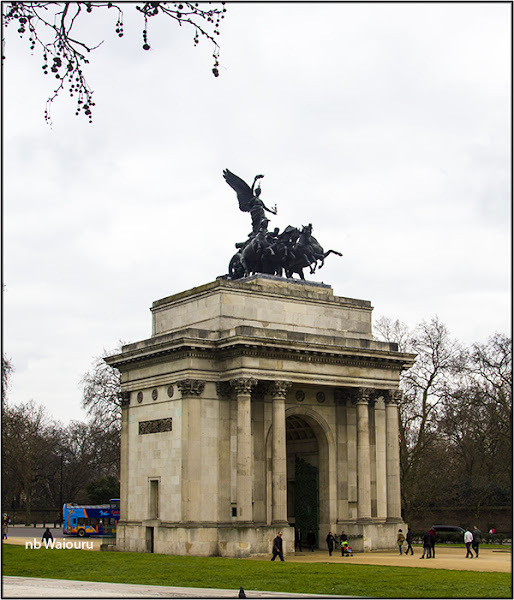 The arch, like Marble Arch, was designed to commemorate Britain’s victory in the Napoleonic Wars. Like Marble Arch, it has been relocate from it’s original position. Moreover it once had a statue of Wellington on top. This was replaced with the quadriga in 1912. However I wanted to see the two war memorials that had been constructed since my last visit. 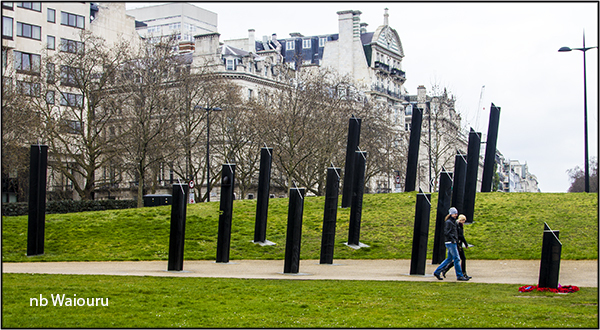 The New Zealand memorial consists of a number of steel cross girders set vertically on an angle. The Australian memorial is a curved sunken wall made from Western Australian granite which is engraved with all the battles and the names of all the towns the service personnel came from. I think the Australian memorial is the more impressive. When was the Australian memorial constructed, Tom? I've visited the NZ one a few times and always find it very moving. 2003 Marilyn. Pre-dates the NZ memorial of 2006. To me the NZ memorial just looks like some old metal girders randomly sticking out of the ground.